The 'quasi-allies' have a fundamental difference in strategic perspective. Pity the news subeditor in summertime Australia. It’s January, the days are languid, and even the Trump administration can’t fill the entire World News section. Unsurprisingly, then, some headlines published in the lead-up to last week’s meeting between Australian Prime Minister Malcolm Turnbull and his Japanese counterpart, Prime Minister Shinzo Abe, with its prospect of a new security deal, were overhyped. No doubt the meeting, which included a visit by Turnbull to a special forces unit and Japan’s missile batteries, was useful. Importantly, the idea of a Reciprocal Access Agreement (RAA) between the two countries remains on the agenda and may be completed later in 2018. An RAA will streamline the stationing of military forces in both countries and further facilitate joint training activities. It was disappointing for those looking to break up a slow news week, however, that any such deal is highly unlikely to trigger a new Cold War. 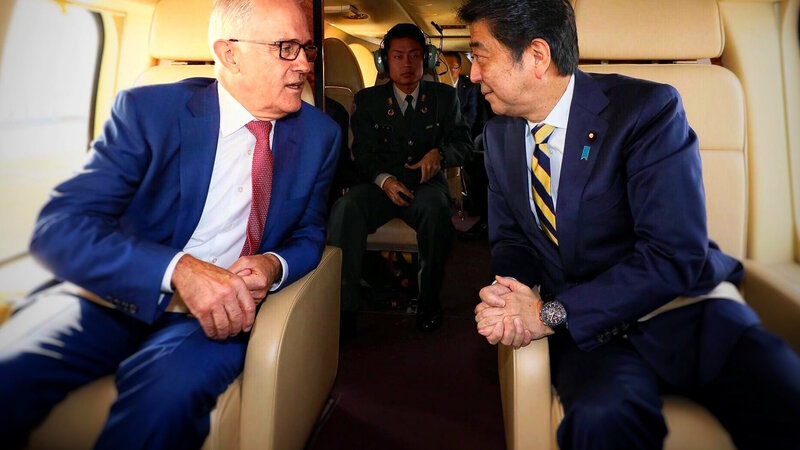 Indeed, as much as it is an important development in Australia–Japan security relations, an RAA does not live up to the more feverish headlines. The anticipated deal is not intended to ‘counter China’s might’, and won’t trigger a major ‘Chinese backlash’. It does not mean that Australia and Japan are now allies. On its own, an RAA is far from a 'precursor' to an alliance, as Turnbull was asked (and avoided answering) in Japan. The term quasi-ally pops up every so often from Tokyo and is now widely deployed in the media. Yet without mutual security commitments (to defend each other against external aggression), this is not an alliance. Instead, the relationship continues to be about capabilities rather than commitments. Nor does a likely RAA suggest that Australian and Japanese strategic outlooks are converging further. The two countries already share a broadly similar strategic outlook: both have concerns about China’s growing assertiveness in Asia, such as in the South China Sea, and a wish for the US to remain actively engaged in the ‘Indo-Pacific’. Both are also deeply concerned about North Korea. Yet Australia’s security concerns are generalised, focused on wider regional stability and the potential for a more contested Asia to impact negatively on its prosperity. By contrast, Japan’s concerns are acute. It has a territorial dispute with China over the Senkaku or Diaoyu Islands in the East China Sea and, as a host of US forces in North East Asia, would be directly affected by any conflict on the Korean Peninsula. This differing immediacy in the strategic circumstances experienced by Japan and Australia leads to a fundamental difference in perspective that will continue to limit the scope for deeper and more formal direct bilateral military commitments. To the extent that there are indirect commitments in the relationship, they continue to be a function of the two countries’ alliances with the US. America remains the pivot. But this does not mean a deal would be unimportant. First, an RAA would demonstrate the continued strengthening of the capability side of the Australia–Japan Special Strategic Partnership. This partnership is focused on steadily increasing engagement in bilateral capabilities in areas such as information sharing, joint exercises, and collaboration on defence technology. Greater interoperability is a key focus. Second, an RAA agreement – the first visiting forces agreement Japan will have signed outside the Status of Forces Agreement it has with the US – would represent the continued progress of Japan’s security ‘normalisation’, which has regional implications. Since the end of the Cold War, Japan has gradually loosened various self-imposed restrictions on its international security role. The RAA forms part of the country’s ambitions to boost its engagement with Asia. Finally, an agreement would reveal that a key logic within the ‘rebalance’ strategy of the US administration of President Barack Obama – that allies and partners around the Asia-Pacific do more for their own security – continues to shape regional behaviour, even if Obama’s policies have otherwise been repudiated by President Donald Trump. In this sense, the RAA is more concerned with keeping the US engaged in the region than with balancing China. Comments coming out of the visit about a Comprehensive and Progressive Agreement for Trans-Pacific Partnership being signed by March can be viewed in a similar vein. To borrow Australia Foreign Minister Julie Bishop’s expression, Japan and Australia are adopting a ‘strategic holding pattern’ in the face of the many uncertainties surrounding America’s role in Asia under Trump. That is, they are moving ahead with plans already in train before Trump intended to buttress America’s regional role, while hoping such planning will prove useful when, or if, US strategic policy-making becomes more coherent. All this unfortunately points to an unpleasant reality for subeditors: that the content of the deal is more noteworthy than newsworthy. Although the headlines might read something like, ‘New military alliance to combat China creates backlash’, a more accurate account would read, ‘Incremental administrative deal allowing for more low-key bilateral security cooperation discussed during quick prime ministerial visit’. More accurate, but not great clickbait. It would be an act of common decency for Australia to put a moratorium on all removals of Hazaras to Afghanistan.